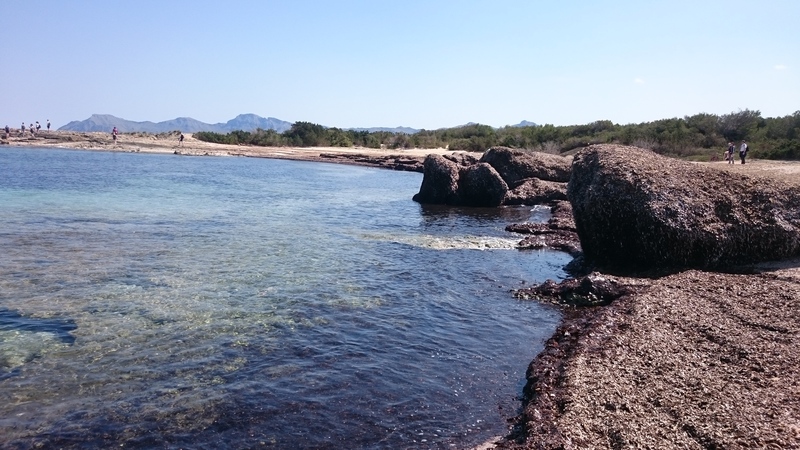 For several years we have taken the students on the Mallorca field-course to the strand-line along the Bay of Pollensa and the dune system near C’an Picafort. Both of these stretches of beach tend to collect odd, fuzzy balls of Neptune’s grass (Posidonia oceanica). Wave action breaks down the dead leaves and rhizomes of Neptune’s grass creating fibres which then become matted into dense spheres. I’ve written a previous blog post about Neptune’s grass on these shores of Mallorca. Instead, this year we visited a different part of the coast where the material accumulates in sculpted waves along the beach edge. Previously I’ve seen this from the window of the coast, so it was interesting to experience it first hand. It is very soft, prone to collapsing and makes the shore edge difficult to walk on. There must be something different about the coastline here which makes the formation of the fibre balls less likely. Whether in balls or loose, the dried Neptune’s grass adds organic matter to the sand and helps to stabilise the dunes further up the beach. 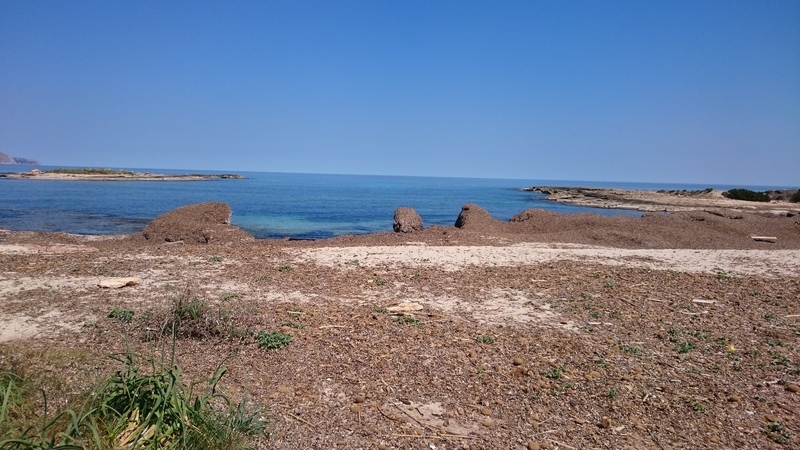 This bit of beach was at the Finca de Son Real, an example of a traditional land-holding now managed by the Balearic Government as a nature reserve and archaeological site. There is a museum here which gives an insight into the lives of the rural people of Mallorca. Through displays of objects, room reconstructions, audio and projections, the museum explores the site from and from neolithic times into the 20th century including an explanation of how local farmers would have collected dry Neptune’s grass to use as animal bedding. 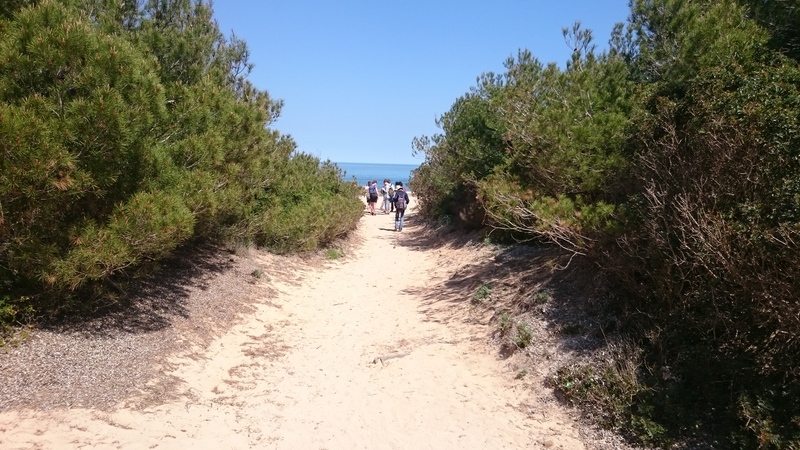 This entry was posted in Adventures, Biodiversity, Museums, Students and tagged dunes, Fibre balls, Finca Son Real, Mallorca, Mallorca field course, museum, Neptune, Neptune's Grass, Posidonia, Posidonia oceanica, Son Real, Students, undergraduates. Abrus precatorius seed necklace on display in the Study. 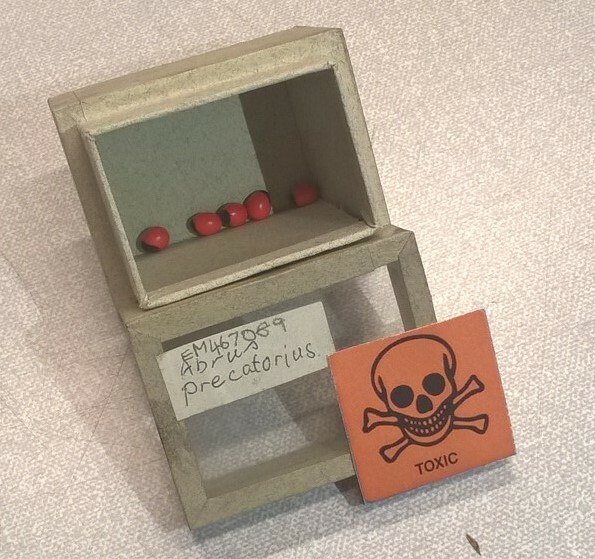 Whilst volunteering at the herbarium I came across several small boxes containing bewitchingly bright red seeds and an equally garish TOXIC sign. They were labelled Abrus precatorius seeds, and that one of their common names is the rosary pea suggests that I am not the first to be taken in by their beauty. The seeds of Abrus precatorius have the eye-catching red of hawthorn berries capped with a black spot at the hilum, but glossy and sturdy enough to be drilled to make beads for jewellery. The contrast between the beauty of the seeds and their toxicity inspired us to begin a blog series on toxic plants called The Poison Chronicles. We want to look at how they can kill, but also why they have evolved this ability and if the plant has any other products that are medicinally useful. Abrus precatorius is a vine in the Legume family native to the Old World Tropics, but was introduced to the Neotropics for it’s ornamental value, but is now an invasive species. It proliferates after a forest fire so can out-compete slower growing plants, it’s suckering ability makes it difficult to remove. But these seeds are more than just beautiful. They have earned their TOXIC label as they contain the toxin abrin, which has a very low fatal dose, reported in the literature as around 0.1 – 1μg/kg, making it one of the most toxic known plant products. Abrin acts by inhibiting protein synthesis, so can affect all cells in the body. A few hours after a person has ingested a lethal dose of abrin, they may experience severe vomiting, gastrointestinal bleeding, dehydration, multi-organ damage and death often within 36-72 hours. 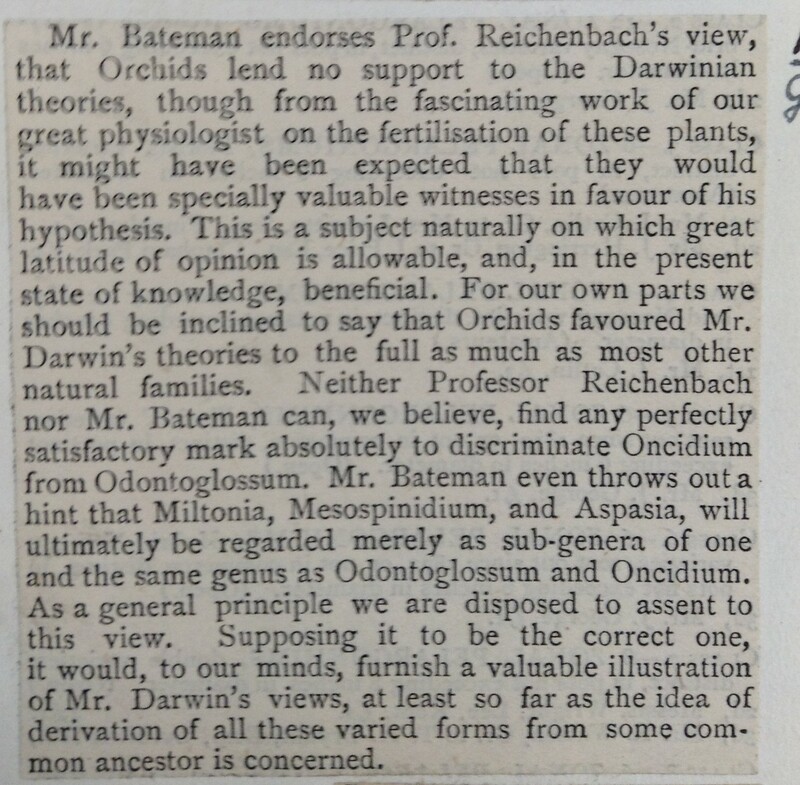 The incredible toxicity of abrin was occasionally used to secretly kill people in 19th century Bengal. The seeds were ground into a paste, shaping into a point known as a sui and left to harden in the sun. This was then mounted on a handle and stuck through the person’s skin by a surreptitious slap to the cheek. Despite this toxic plant being widespread, there have been very few cases of abrin poisoning. The thick indigestible coat of mature seeds meaning that if seeds are swallowed whole, they are unlikely to release much abrin and symptoms are mild. Chewing the seed releases the toxin, and it has been reported that a single well chewed seed could kill. However, a case of a patient attempting suicide through ingesting 10 crushed A. precatorius seeds survived after swallowing activated charcoal. 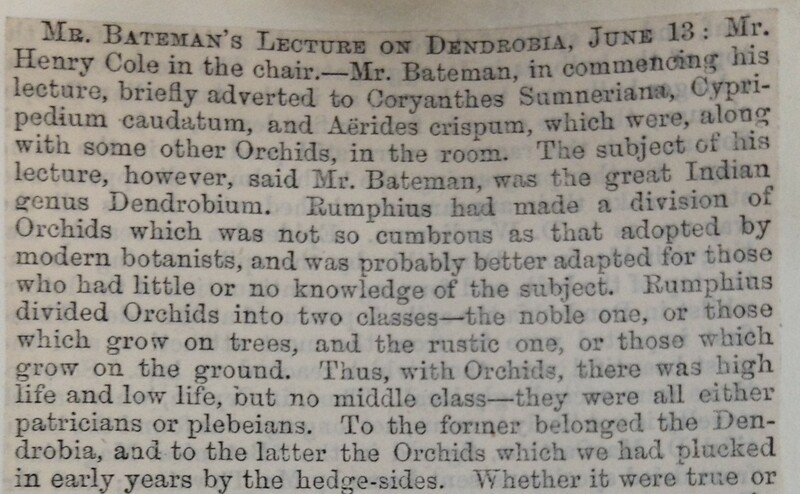 Except when used or taken deliberately, it is surprisingly difficult for humans to be poisoned by A. precatorius, so for most this plant poses more of a threat to your garden as an invasive than your health. An obvious question is why these seeds contain such a deadly toxin. I have been unable to find any research on this. But it may be that the thick seed coat means the toxin isn’t a defence against herbivores ingesting the seeds at all. As it has been reported that the seed is dispersed by birds who would not chew the seed and would instead disperse them in faeces, it is possible it is a defence against mammals chewing the seeds. 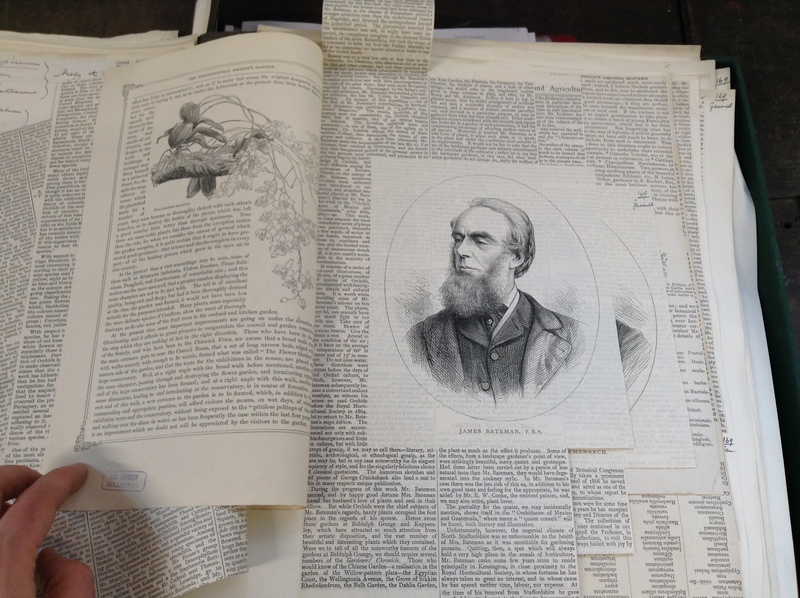 A. precatorius has not always been seen as a deadly beauty, and has been used a traditional medicine. Extracts of the seeds have been used in the Pothohar region of Pakistan as a purgative and an aphrodisiac and in rural Bangladesh to treat erectile dysfunction. The symptoms of poisoning by abrin suggests very low doses could work as a purgative, there is a high risk of administering a lethally high dose. A. precatorius‘ entire biochemical system makes it toxic, so single chemical plucked out of this network can have very different properties from the plant as a whole. In contrast its traditional uses, experiments have been done which show that abrin injected into laboratory mice damages the DNA and reduces production of sperm cells, though the long time period needed for DNA repair to occur means it is unlikely to be used in commercial birth control. Abrus precatorius demonstrates the multi-faceted nature of plants: at once a beauty and a (potential) killer; a toxin and used as a medicine. 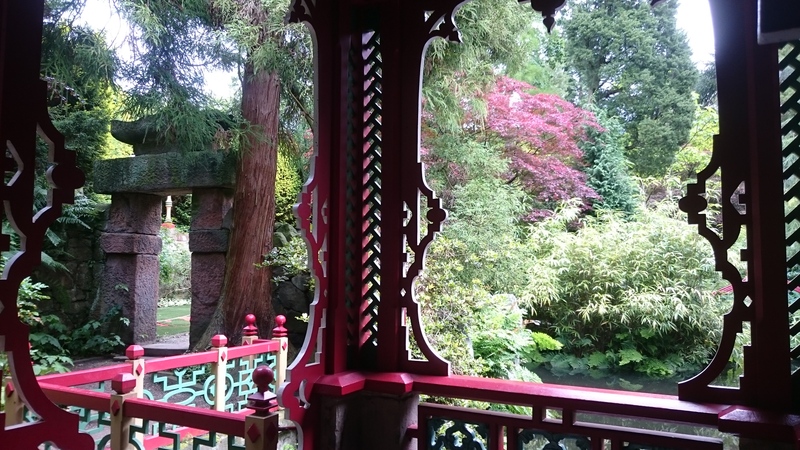 What wondrously poisonous plant would like to find out about next? Leave your comments below. 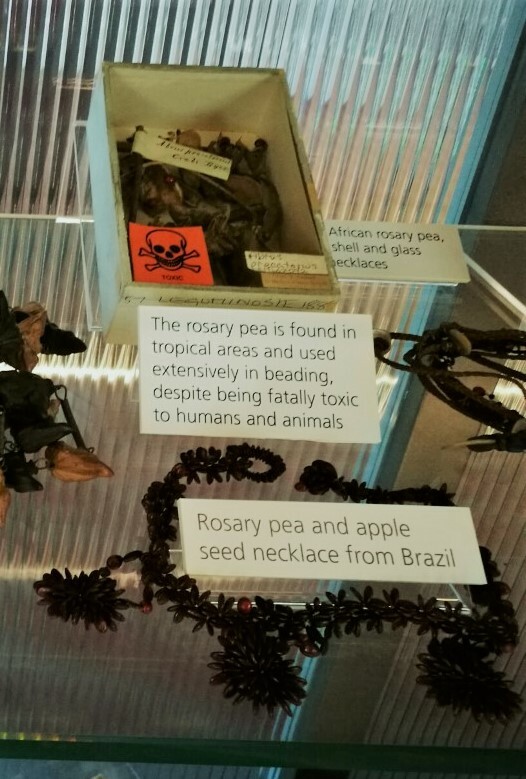 This entry was posted in Adventures, Manchester Museum, Poisonous plants, South Asia, The Poison Chronicles, University of Manchester and tagged Abrus precatorius, botany, Deadly, Herbarium, jewellery, Manchester, medicine, museum, plants go wild, poison, poisons, Rosary pea, specimens, toxins.